Robert was born at Hardin County, Kentucky, on 2 September 1853. He married Anna Elizabeth Gray at Millerstown, Grayson County, Kentucky, on 6 September 1879. Robert A. Tabb was buried in 1935 at Rutland Cemetery, Rutland, Marshall County, Illinois.1 Robert died in 1935 at Rutland, Marshall County, Illinois. George was born at White Mills, Hardin County, Kentucky, on 23 August 1856.1 He married Fannie Hardin Gray on 8 January 1883. George died on 10 April 1933 at Mason City, Cerro Gordo County, Iowa, at age 76.1 He was buried after 10 April 1933 at Corwith Cemetery, Corwith, Hancock County, Iowa. [S916] Source: Information received from Dennis Henderson (e-mail address) via e-mail dated 25 March 02. He married Martha Jane Tabb. Frank died. Frank was born. He married Martha Jane Tabb. His body was interred at Shawnee, Oklahoma, at Fairview Cemetery.1 Thomas was born. Thomas died. William was born at Hardin County, Kentucky, in January 1857. William died on 10 July 1887 at age 30. Joel was born at Hardin County, Kentucky, on 10 August 1863. Joel died in September 1863 at Hardin County, Kentucky. Oma was born at Minonk, Woodford County, Illinois, on 23 October 1883. 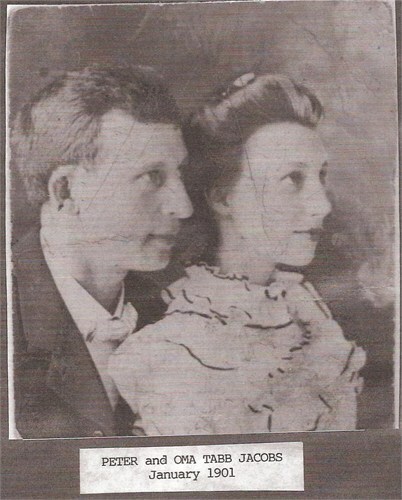 She married Peter Jacobs at Pontiac, Livingston County, Illinois, on 8 January 1901. 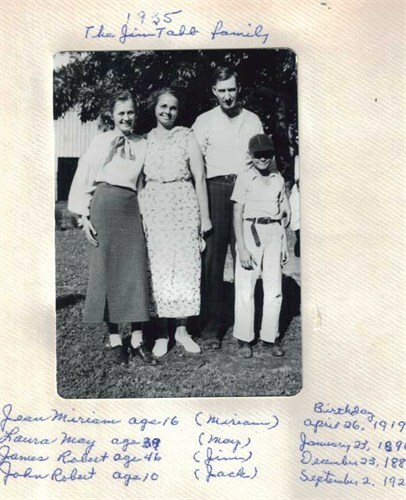 Oma died on 17 March 1963 at Mason City, Cero Gordo County, Iowa, at age 79. Peter died. Peter was born. He married Oma Lee Tabb at Pontiac, Livingston County, Illinois, on 8 January 1901. She married John Chambers. Lois was born at Millerstown, Grayson County, Kentucky, on 3 November 1887. Lois died in 1972 at Klemme, Iowa. He married Lois Ann Tabb. John was born. John died in 1963 at Iowa. He married Laura May Wilson. James was born at Millerstown, Grayson County, Kentucky, on 23 December 1889. He was buried in 1953 at Corwith Cemetery, Corwith, Hancock County, Iowa.1 James died in 1953 at Corwith, Hancock County, Iowa. Arthur was born at Hardin County, Kentucky, on 7 September 1893. 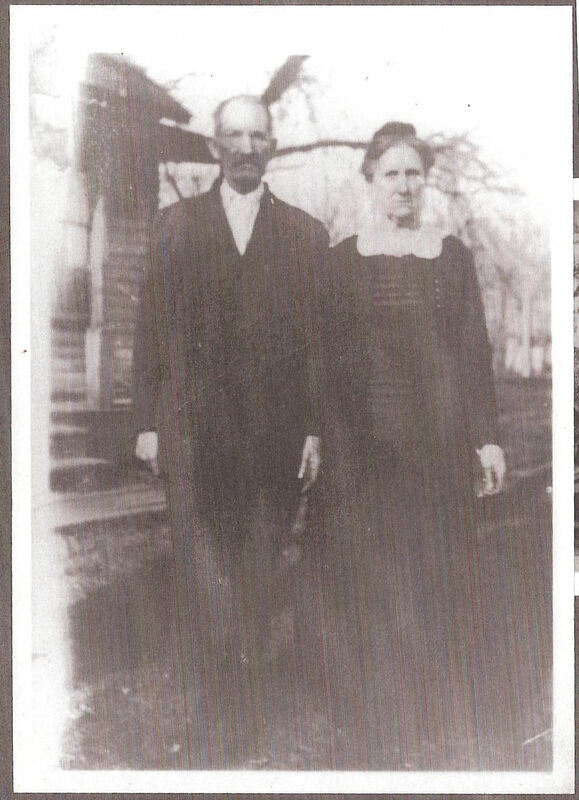 He married Ara Luella Whetsler at Algona, Kossuth County, Iowa, on 22 December 1920. Arthur died on 2 October 1968 at Corwith, Hancock County, Iowa, at age 75.1 He was buried after 2 October 1968 at Corwith Cemetery, Corwith, Hancock County, Iowa. 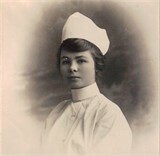 Ara was born in 1901. She married Arthur C. Tabb at Algona, Kossuth County, Iowa, on 22 December 1920. Ara Luella Whetsler was buried in 1950 at Corwith Cemetery, Corwith, Hancock County, Iowa. Ara died in 1950. Grotes was born at Millerstown, Grayson County, Kentucky, on 7 September 1896. Grotes died on 26 February 1917 at age 20.1 He was buried after 26 February 1917 at Corwith Cemetery, Corwith, Hancock County, Iowa. Lucy died. She married Joseph Oleson. Lucy was born at Long Point, Livingston Co., Illinois, on 2 December 1899. He married Lucy Maude Tabb. Joseph died. Joseph was born. [S68] May have died in California.